With a name referencing Marvel’s hardest matter in the universe, Spain’s Adamantivm are clearly trying to make a statement, and in some ways succeed. They’re of their country up to a point in that lyrics are Spanish and guitars are melodic in an almost modern death metal fashion, riffs from an older school of influence than the American Bay Arena or Germanic big three. Yet this isn’t audibly de España, as the single English language track proves by fitting in very well. Thrash is a language spoken by most Metalheads, and when done well it’s universally popular. Modern bands trying to compete with the big, classic names are stuck between the rock of copying them and the hard place of trying to create their own identity. Most strike a balance between the two, and as a result most modern Thrash bands sound somewhat similar. Adamantivm are no different in this regard. Yet for an unsigned band, this is impressive stuff, lacking only in sound quality as to be expected. The instrumental intro to opening track Los Perros de Tíndalos is interesting and evocative, riffs added gradually before breaking into a raw gallop, vocalist Javier’s gruff chant changing to a more cleanly-sung approach enhanced by backing vocals that work very well indeed behind the guitars. Not that you’ll be noticing much apart from the guitars the first time around, since as the track goes on they develop into the song’s main reason for existing and by the time it fades out you’ll breathe a sigh of disappointment. The title track follows, a mildly progressive structure with breaks for militaristic drums and spoken lyrics proving the band are ambitious where they need to be, and the ensuing breakdown into thrash speed also proving they have a solid foundation to build on. Although moments like that don’t happen nearly often enough, for some it won’t matter. That foundation, especially in Thrash, is all bands really need to be reasonably successful. On that basis alone, Adamantivm have done well here to make a largely ripping and fun album as the punky B52 or the Slayeresque intensity of Sin Misericordia show. Where they stumble is in reaching above and beyond that, the mellow and rather forgettable Matar Para Morir like a Testament ballad from their fallow early 90s period. 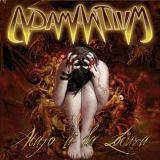 In addition, Adamantivm have a slight songwriting problem in that the likes of La Sermilla Del Odio don’t really have enough different riffs – several tracks on the album seem rather samey, and there aren’t massive steps made to avoid repetition. Little touches like the Iron Maiden melodies and section of blastbeats on Tumba Con Tu Nombre only help a little, and the Slayer influence that keeps popping up on Instinto Vital makes the track seem more like a cover than an integral part of the album. Expecting too much from Adamantivm at this stage might be a little unfair of me, but I’m sure the band would want me to be as stringent on them as I would were they signed. It shouldn’t take many changes to their sound for them to gain label attention – a bit more variety, a bit less of the filler, and more of their own identity shining through would work wonders. As things currently stand, Atajo A La Locura is a competent, enjoyable effort with interesting vocal work but enough flaws to mean that it does little to differentiate itself from a thousand other albums from a thousand other Thrash bands doing much the same thing. Tackling that should be the band’s next step, and I look forward to hearing the results.